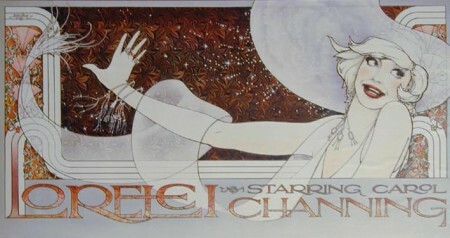 This Lorelei Carol Channing Play Poster Original Key Art by John Alvin was created at the beginning of his career in the entertainment field in 1973. It at once celebrates his and Channing's talent. "Creating the promise of a great experience" is how John Alvin described his role as the preeminent designer and illustrator of cinema art in the entertainment industry. In a business where you are only as good as your last job, Alvin was diverse enough in style and creative invention to be one of the ultimate go-to artist for movie posters in Hollywood for over two decades. He designed and illustrated some of the world's most widely recognizable movie art. From E.T. to Blade Runner, to Blazing Saddles and The Lion King, John Alvin is responsible for many of your favorite movie campaign images... Alvin's first official movie art campaign was the poster for Blazing Saddles, directed by Mel Brooks, in 1974. Alvin, who was working as an animator at an animation studio at the time, was invited to work on the Blazing Saddles poster by a friend. Alvin took an unusual path when designing the movie poster. He designed a serious movie poster, which incorporated unusual and quirky elements from the film. For example, in the poster, Alvin depicted Mel Brooks, who plays a Yiddish-speaking Native American chief in the film, wearing a headdress inscribed with the phrase, Kosher for Passover. The joke had been suggested by Alvin's wife, Andrea. Alvin's work on Blazing Saddles was liked by Mel Brooks, as well as by others in the industry. He went on to work on a number of Brooks' later films, including Young Frankenstein, which was also released in 1974. Another of Alvin's iconic posters was his work for Steven Spielberg's 1982 film, E.T. the Extra-Terrestrial. It showed E.T. 's finger touching the finger of his human friend, Elliott, finger tip to finger tip. The fingers create a glow where they touch. The idea for the poster was reportedly suggested by Spielberg, and was inspired by Michelangelo's painting, The Creation of Adam. Alvin used his daughter as the human hand model for the poster. Alvin created artwork for more than 135 film campaigns over the span of three decades. His work for such film studios as New Line Cinema, Warner Bros. Entertainment, Disney Studios and Lucasfilm Ltd., included Blade Runner, Cocoon, The Lost Boys, Predator, The Princess Bride, Gremlins, The Goonies, The Lion King, Beauty and the Beast, Batman Returns, Batman Forever, and Jurassic Park. 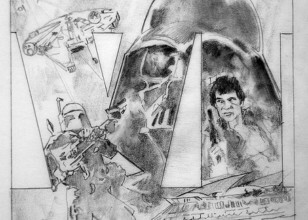 He also created the anniversary posters and other artwork for the 30th anniversary Star Wars Celebration. In later years he created posters for Peter Jackson's Lord of the Rings trilogy, the Harry Potter film series and Walt Disney's Pirates of the Caribbean films. According to John Sabel, an advertising executive at Walt Disney Pictures who often worked with Alvin, "There was a reason why The Lion King did the numbers that it did... 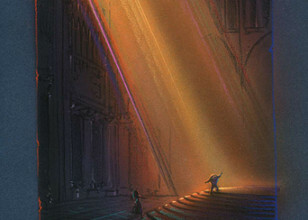 There was a reason why 'Hunchback [of Notre Dame]' became a big success. It's because of the images that were produced, and a lot of those were John Alvin's paintings." Alvin's poster for The Phantom of the Paradise was selected by the National Collection of Fine Arts, the Smithsonian Institution Smithsonian Museum and the Museum of Modern Art to be included in "Images of an Era (1945-1975)," a collection of posters that toured Europe as part of the US Bicentennial. In later years, Alvin focused more on cinematic fine art as the importance of movie posters was usurped by newer forms of digital advertising. Alvin's fine art portfolio centered on movies artistically, rather than on advertising. The Art of John Alvin, written by Andrea Alvin, a book collecting a large portfolio of his work, was published on August 26, 2014 by Titan Books. ArtInsights, exclusively retail Alvin’s original works to the public. The book includes examples of publicly used artwork, as well as previously unseen paintings and sketches, with a forward by Jeffrey Katzenberg and commentary by his widow.